Do you long to have stability and security? A rewarding job with good pay? A spacious home in a comfortable neighborhood? Maybe God has something else planned for your life. Living by faith is a frightening idea for many people. 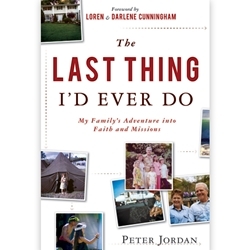 It certainly was to Peter Jordan, who had a good job, a beautiful home, two newer cars, a growing family, and a respectable position in his church. In fact, entering missions was the last thing he thought he’d ever do. But God called him and his family out of the ordinary and into an uncertain, but ultimately fulfilling, life of trust and obedience. This true story of a family who shocked friends and family by leaving their comfortable life to follow God’s call will challenge your assumptions and inspire you to new endeavors. Faith can be a frightening place, but nothing compares to the adventure of entrusting yourself to the capable and loving arms of the Father.